Apple is so massive that even a design flaw on one of its products—like the single USB-C port on the 12-inch MacBook—can spawn hundreds of devices dedicated to solving the problem. 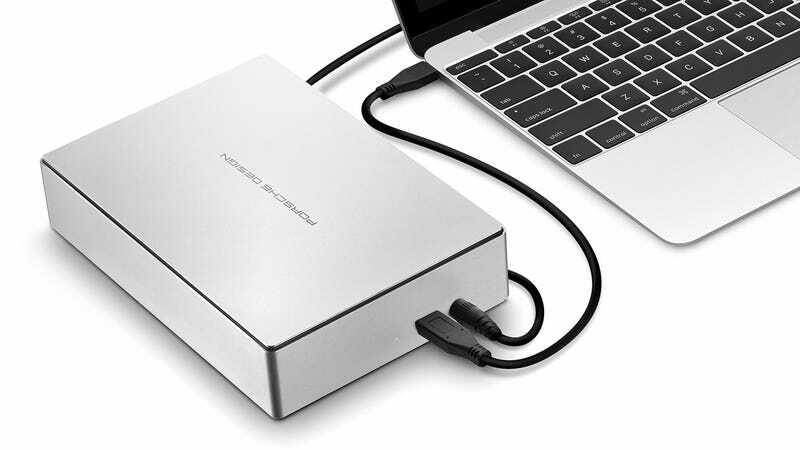 Even LaCie’s new Porsche Design Desktop Drive promises to keep your port-challenged MacBook charging while it’s connected. A giant external drive sitting on your desk used to be the exclusive domain of video editors. But vast collections of high-def movies and thousands of digital photos demand a lot of storage, far more than the tiny SSDs used in ultra-thin laptops can hold. An external drive is now a must-have, so why not opt for something with a little style? LaCie’s new Porsche Design Desktop Drive comes wrapped in a sand-blasted all-aluminum enclosure, and 4TB, 5TB, or 8TB capacities starting at $210 when available come March. It does require power, so say goodbye to yet another outlet on the already crowded power strip under your desk. But that also means the drive can share power with a 12-inch MacBook when it’s connected to the tiny laptop’s single USB-C port. An additional USB port on the new drive would have been useful for accommodating other accessories, but it’s hard to point the finger at LaCie when the company is already trying to solve Apple’s mistake.